Policymakers often assume that sales and excise taxes are the primary reason for variations in the price of goods and they too often assume that consumers consider differences in tax rates across jurisdictions when making purchases rather than differences in the total price (tax plus non-tax price) of a good. A good example was the $.10 drop in NH’s cigarette tax in 2010. Some thought the decrease would be a beacon to NH for consumers. But the decline did nothing to lower the price of cigarettes in NH because manufacturers increased their price by an equivalent amount immediately after the tax decrease (effectively capturing the revenue that would have gone to the State of NH). I did a fair amount of gloating in an early post as the revenue numbers reflected my predictions. Consumers saw no price break and no major changes occurred in other states so no increases in competitive advantage for retailers occurred in NH (retailers saw no benefit) and the longer-term trend of declining smoking rates (along with a things like higher gasoline prices and fewer visitors to the state) were the primary determinants of sales trends, and thus lower revenues. The demand for gasoline, like cigarettes, is relatively inelastic so it takes a surprisingly large price increase to change consumption very much but differences in prices among locations may shift the location of some gasoline sales where consumers can conveniently choose where to make their purchases. I can buy gasoline as easily in Maine as in NH and with a little more effort I can also buy in MA. I often can get gasoline as or even a bit cheaper in MA than in the town where I live, but I can’t get gasoline cheaper in Maine. I can also get gasoline cheaper if I drive a few miles to towns just north and south of me, or even to a gasoline station on the other side of town. These price differences are often $.10 per gallon and occur among retailers of similar types – i.e. gasoline stations with a convenience store, the same brand convenience store selling the same brand of gasoline. 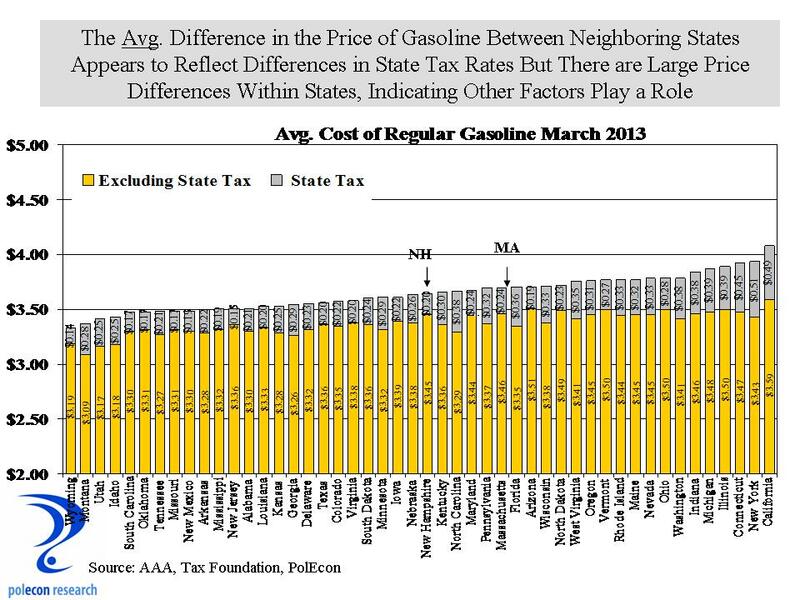 Nevertheless, when I look at the average price of gasoline between neighboring states (with some exceptions like California where environmental regulations have large retail price impacts), the differences in price appear to be strongly related to differences in state tax rates (r=.82). Comparing statewide average prices and tax rates for gasoline masks much of the variation in pricing that occurs within states and even within communities. That is one reason why I think policymakers focus so much on tax rates as the primary reason for price differences. Despite all of the attention to gasoline prices and proposals to raise or lower gasoline taxes over the past decade there has been surprisingly little research on the retail price impacts (or “pass-through” effects) of changes in gasoline taxes. That may be because changes in gasoline taxes are relatively small (usually a few cents) compared to the much larger price changes that occur as a result of supply/demand issues and variations in the world-wide price of oil. 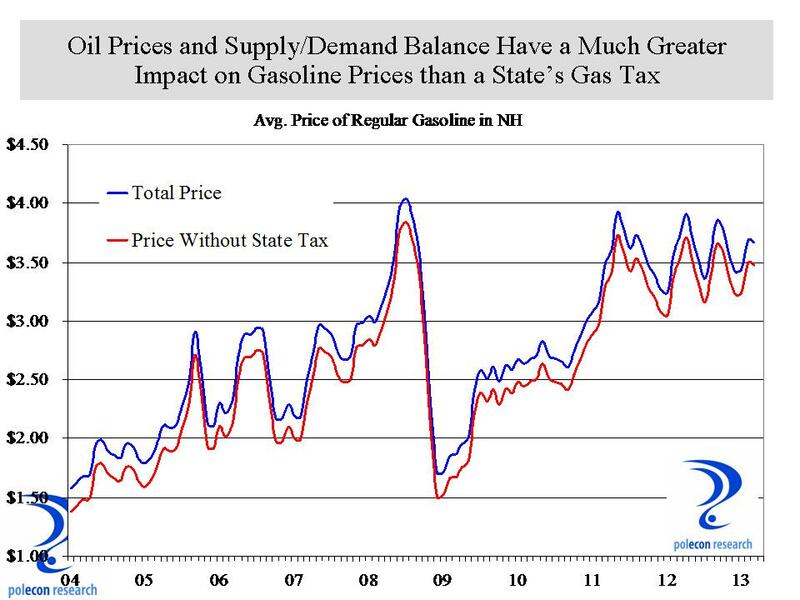 The chart below shows how gasoline prices in NH have changed since 2004 and it also shows the theoretical price if the state had no excise tax on gasoline. The red line shows the theoretical prices because, like cigarettes, retail prices may or may not be reduced by an equivalent amount if the gasoline tax were lowered. The theory of tax incidence suggests that sales and excise taxes should be fully passed on to consumers in competitive markets with constant marginal costs. Less than full “pass-though” is expected in markets with increasing marginal costs, while the pass-through rate may be less than, or greater than, one-hundred percent in markets that are less competitive. In addition, tax increases in one state may lead to higher prices across the border as stations there face greater demand. A study examining a temporary reduction and reinstatement of a 5% gasoline tax in Illinois (sorry I can’t find the reference) found that that when the 5% tax was eliminated, prices declined by 3% and when the tax was reinstated prices rose by 4%. Politicos are looking to score big points for their positions on gasoline taxes. There was a time when whatever marginal changes lawmakers made to gasoline taxes may have meant a lot to changes in prices at the pump. Right now, and in the future, changes in world-wide oil markets are likely to overwhelm any impacts from changes in state taxes and together with the uncertainty over the degree of pass-through, make any predictions about the economic impacts of gasoline tax hikes nearly impossible. This entry was posted on March 27, 2013 at 11:19 am and is filed under Energy, Gasoline, NH, taxes. You can subscribe via RSS 2.0 feed to this post's comments.